Josting is a medium sized family business situated in a beautiful area of Germany, Josting have been designing and manufacturing guillotines for over eighty years and for many industries, including; veneer, foil, and paper guillotines. With a dedicated and experienced workforce Josting have been able to establish a proven production system that controls overheads and ensures they remain competitive in a modern world. With a quality control second to none, Josting ensure their equipment is of the highest standard that will give their customers peace of mind, knowing they have purchased a machine that solves all their cutting requirements in one stroke. 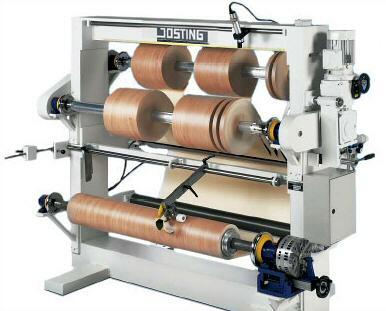 A Josting length cut veneer guillotine has been in existence since 1925 and over the years has developed into a sophisticated, safe and accurate cutting machine of veneer bundles. The machine will produce precision straight and parallel cuts which allow tight joints to all veneer splicing. The cutting action of the blade is created by a brake motor and gear unit with a crank driving action. This action is transposed into a horizontal cutting action and powerfully slices through the veneers at twenty degrees. The brake motor is intermittent as is also the hydraulic unit for the pressure beam and only works when cutting, thus keeping noise levels down to a minimum. The cutting blade is removed from the front of the machine making blade changing safe and quick. The blade has 30mm of sharpening area and is hardened to its full height to prevent the blade from deforming up to its final regrind. 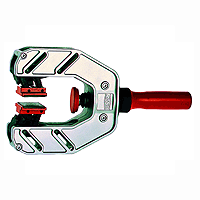 The cutting insert has a unique design and gives 16 positions for cutting before replacing. Timer for blade return stroke. Right hand 90° fence for cross cutting. Motorised back fence for rough positioning. Manual wheel for the final accurate position. Digital read-out of the back fence position. A green light for locating the cut position. Two button operation for safety. Two pressure setting to the pressure beam. Photo cell guarding to the cutting area. Re set button, required when emergency stop is actuated. Top blade operated by an electro-mechanical movement. Full width hydraulically operated pressure beam. Cutting mats to top and bottom are full width. The pneumatic back fence is hinged to allow rear ejection of the veneer waste. This double knife guillotine will cut an average of two bundles of veneer per minute over a day's production. 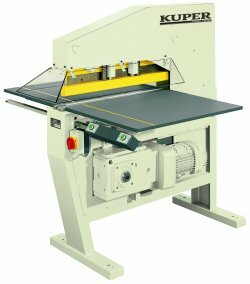 This unique cross cutting guillotine is designed to prevent tear-out and the splitting of the grain with its powerful vertical cutting action. Due to the narrow head construction the operator has an excellent view of the veneer and the cutting area. The knife bevel is located on the right hand side of the blade for working from left to right but optionally this can be reversed. Plexiglas guarding to the cutting area. Steel fence at 90° to the blade with two positions. The sprung loaded pressure beam is lowered at the same time as the blade by a brake motor and gear unit with a crank driving action. 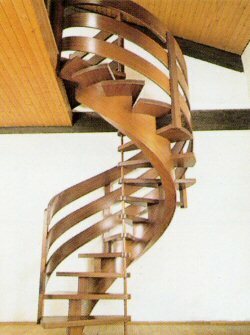 This action is transposed into a vertical cutting action and powerfully slices through the veneer. The brake motor is intermittent and only works when cutting, thus keeping noise levels down to a minimum. 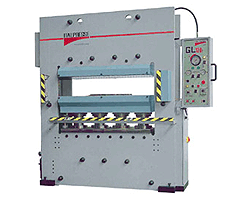 This unique cross cutting guillotine is designed with a 'G' frame to allow the feeding of the veneer bundles from the front of the machine as well as end loading. Due to the narrow head construction the operator has an excellent view of the veneer and the cutting area. The knife bevel is located on the left hand side of the blade for working from right to left. Steel fence at ninety degrees to the blade with two positions. The sprung loaded pressure beam is lowered at the same time as the blade by a brake motor and gear unit with a crank driving action that slices through the veneer at twenty degrees. The brake motor is intermittent and only works when cutting, thus keeping noise levels down to a minimum. 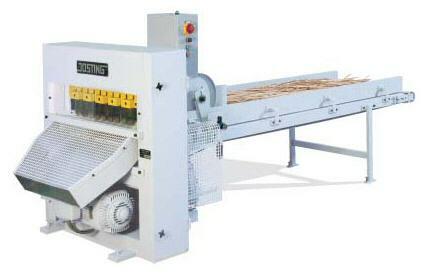 A chopping machine especially designed for veneer waste strips and veneer pack trimmings. By simple adjustment the size of the cut chipping can be varied to suit the customer's needs and then transported directly to the disposal skip or directly to your factory burner as a free fuel by the use of the extraction system. If skips are used to remove the chippings the cost of the skips are reduced from between 50% and 75% and labour cost are drastically cut by eliminating the need for labourers attempting to manually compress the veneer strips into the skips. 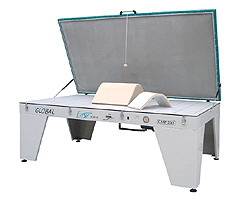 Labour cost can also be reduced on the shop floor as the waste veneer can be transferred directly from the guillotine to the chopping machine. Justification is therefore easily achieved when purchasing this equipment. The Josting foil cutter has been designed to automatically cut furniture foil materials from the roll to cut size sheets. Counters for length cut and number of cut pieces. A pole-changing brake motor ensures high accuracy for length cutting. Cut pieces are stacked on a collecting table. Air rail at the out-feed to assist stacking of the cut pieces. 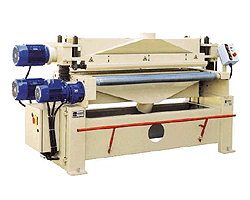 Circular knife slitting unit for sizing the roll prior to length cutting. 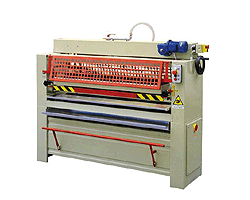 The Josting foil slitter has been designed for the exact and neat slitting of furniture foil materials. 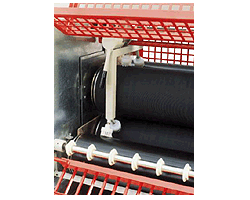 From one wide roll, several narrow rolls can be slit to cut size and rewound onto the out-feed station. Ideal for the foil wrapping industry where different width foils are required to produce various furniture components by wrapping foils around MDF shaped components. 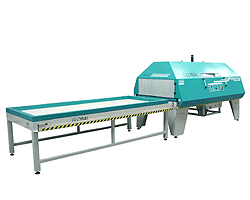 This unique high speed cross cutting system utilises the cross cut guillotine, model: QFS 850 combined with in-feed and out-feed conveyors which can be set for defect cutting or an automatic cutting cycle. The operator marks the defect area on the veneer bundle with chalk and sets the conveyor in motion. Cameras detect the chalk marks and automatically cuts out the defected areas. 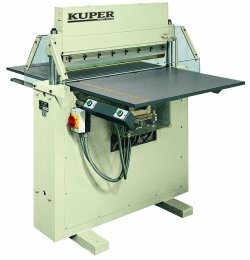 When it comes to joining two pieces of veneer together there is only one name that comes to mind, Kuper "The market leader". 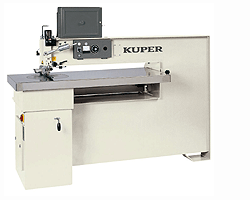 Kuper are the experts when it comes to the assembly of cut veneer strips to produce veneer sheets or lay-ons as they known by. The most common method is the Zig-Zag glue thread joint and the less common being the glued edge splicing method. This German company have been very successful in developing the technology of veneer bonding and there is no other as prominent in this field of engineering. Model: FW/mini 630 is suitable for the small producer and sits on the bench during use and under the bench for storage, this model can also be supplied with its own mobile stand. Has a feed speed of 7 metres per minute and is equipped for single phase electric supply. 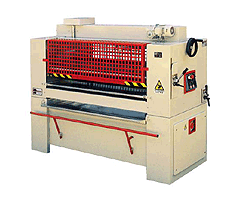 Model: FW/920 Junior is a low production machine with a speed of 15 metres per minute. With three phase electrics, this model requires air to assist in the melting of the adhesive on the jointing thread. Model: FW/1150 the most common of the stitcher family with a throat depth of 1,150 mm, three phase electrics and a mechanical variable speed unit of 15 to 30 metres per minute. Model: FW/1200E looks very similar to the FW/1150 but has a throat dimension of 1,200mm and electronic gearbox that has variable speed between 30 and 60 metres per minute. Ideal for companies manufacturing large lay-on.s where speed is required for joining long sections of veneer, hence approximately halving the time to produce a lay-on. Model: FL/Innovation the most talked about edge splicing machine that glues and edge splices veneers at an average speed of 28 meters per minute. Fitted with a small glue reservoir for Urea adhesive that can be cleaned and replenished in around 10 minutes, (with or without a glue cooling unit). 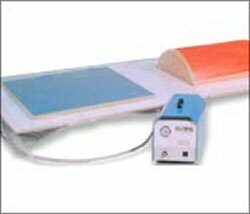 Six sets of heaters are situated inside the clamping track and can be individually controlled. With infinite control of the heaters, air pressure and time, this machine can cope with all veneer species. 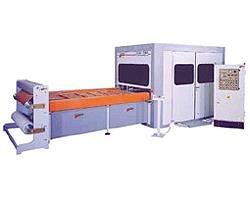 High production requirements can be accommodated with lateral loading machinery which can produce a continuous carpet of veneer or cut to size lay-ons. 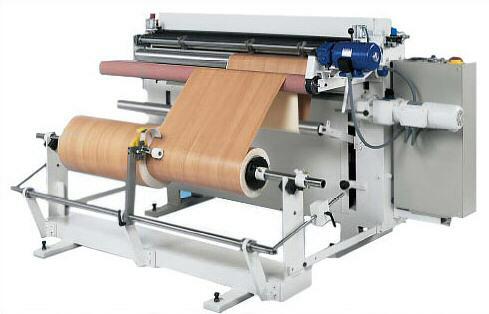 End binders can be linked in tandem with these machines and are designed to prevent the veneer from splitting along the outside edges of the lay-on and can also trim veneers to length at the same time. We can supply the best layout for your factory. Kuper produce a very high quality shrink-wrapping machine that can be utilised in many industries for high quality shrink-wrap packaging. 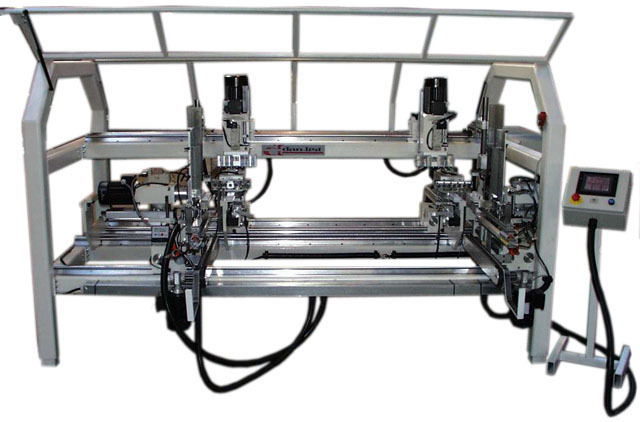 The machine's specification can be tailor-made to suit your product and can consist of - an infeed conveyor - a single, double or triple polyurethane roll holding station - intermediate conveyor - side welding station - heated shrink tunnel - outfeed conveyor. Max. weight of any one article to be wrapped. Number of components in a day. Please call or e-mail for a general leaflet. Dan-List has been manufacturing rail boring equipment for over 30 years and is probably the market leader in this type of machine. What is a rail? We would identify it as a narrow component used in furniture construction and produced in various lengths and usually in large quantities. 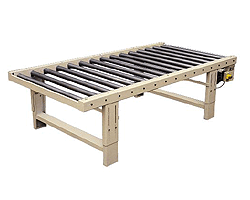 These rails may require boring on 1, 2, 3, 4 or even 5 surfaces and due to their narrow width are difficult items to control when manoeuvring inside a machine. 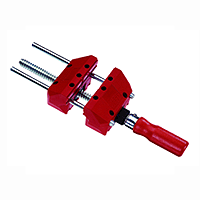 This is where Dan-List has become very proficient and can now design a machine specifically for your range of rails, even for the grooving of draw fronts or the milling of tenons at the ends of some rail designs. 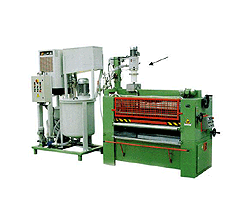 Dan-List dowel boring machines type BA series. 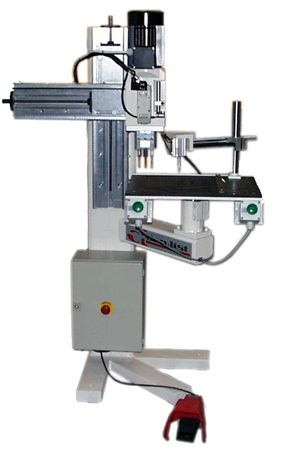 The BA series is an automatic universal dowel boring machine with magazines. They are ideal for flat, a little curved, and round work pieces and come in many different sizes and types, which makes it easier to find the correct model that fits your needs. It could be drilling of only one item or even more items on the same machine. The machines are very simple to operate and every single machine is delivered with a PLC controller, which makes it possible to leave the boring units not in use on standby. Furthermore the PLC controller makes it possible to choose the sequence on the units, and therefore the units cannot collide during operation. 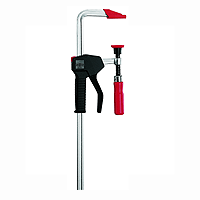 Should it be necessary for cleaning your drilling hole, step by step drilling can be offered. Dan-list Classic. The Dan-list Classic line was introduced in the autumn of 2003. The first machine in the line has been installed and in full production. 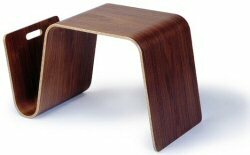 The Classic is built especially for legs to beds, tables and other work pieces which need to be drilled from three sides. Furthermore you can add end boring to the machine so that you can drill all five sides at the same time. Normally you will need to put the work pieces through the machine at least twice in order to drill all five sides. This system improves efficiency and increases capacity. Exact cycle times will be quoted with each machine. This machine has been constructed to accept work pieces either from an operator or straight from another machine and has been designed with a PC memory for at least 100 different programmes. This ensures a quick set-up from one work piece to another by calling up the program name. The main advantages are quick set-up, one pass component drilling and as a standard feature we have added a security system, which prevents access to the machine while in operation. BM 500 H-V. The Dowel Boring Machine BM 500 H-V is the smallest of our boring machines, it works with an adjustable boring unit for both horizontally and vertical boring, and is very simple to operate. 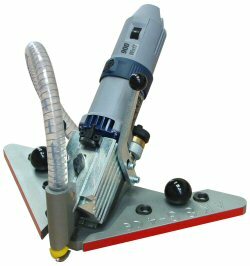 A universal boring machine for both curved and straight work in a simple and space saving design. Furthermore there is a quick adjustment from horizontal to vertical boring and vice versa. The boring unit revolves 90° around its own axis, and the boring head revolves 360° around its own axis. Dan-List Classic Auto-Set. The Classic Auto-Set is a fully automatic boring machine, with a personal computer memory for up to 99 different programmes. However, if there is a need is for a greater memory size, one can be provided. The set up of the machine is carried out on the PC, where the various co-ordinates for each boring unit, magazine etc, are entered. Once this program has been completed it can be recalled and the machine sets everything automatically to within 1/10 mm and within 60 seconds. This makes the Dan-List Classic Auto-Set unique for high production and low batch numbers. 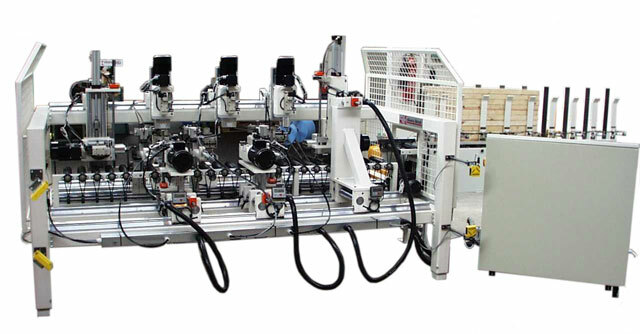 The capacity of Dan-List Classic AutoSet varies from 15 - 20 work pieces a minute, the exact capacity will be quoted on each individual machine and can include the routing unit for making the grooves in the drawer fronts. Minimum and maximum size of work piece are individually determined. The boring heads can be delivered with quick lock spindles for quick tool changing and the boring heads and boring units are of course made in our own factory, so we know the quality is 100%. If rails and draw fronts are a part of your production and you are investigating a means to cut manufacturing time and cost, please contact us and we will offer a solution to do just that. After many years of successfully producing high quality veneer guillotines for the woodworking industry, the SAVI company have now decided to stop manufacturing their equipment and close their factory. The personnel at Realwood have had many years of successful trading with Savi and are very sorry to hear of this decision. We would like to assure all the UK customers with Savi equipment that continuity of spare parts, service repairs and assistance will continue wherever possible. TFK: Cross cut veneer guillotine. 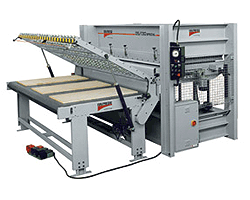 MFK: Length cut veneer guillotine. 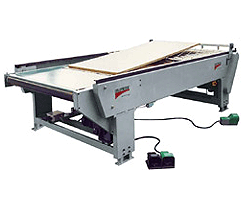 HFL: Length cut veneer guillotine. 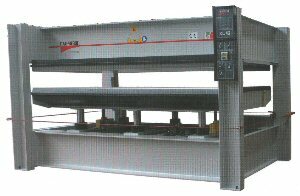 HFK: Length cut veneer guillotine. D: Double knife length cut veneer guillotine. 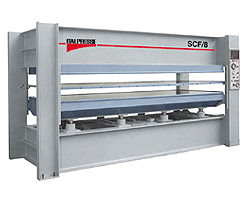 SAF: Paper foil slitters and cutters. Many spares are currently in stock, the most common being: Spare blades or guillotine knives, cutting sticks, green light spare bulbs, hydraulic cylinder seal sets, safety guard switches and many more. 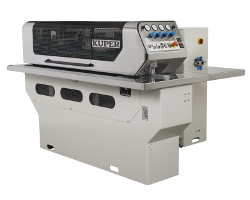 As the quality UK veneering machinery and consumables specialist, Realwood had to find an alternative veneer guillotine for their customers that were of a very high standard and so an alliance was set up with the Josting - Kuper range of machines. 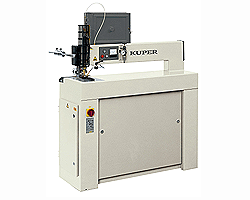 The German company Josting have a marketing arrangement with Kuper and these machines can be seen on this web-site in our machinery section. Please call us if you are looking to replace your guillotine, have a problem with your existing equipment, or just require assistance with either range of machines. Osama are a specialist manufacturer in the industry of glue application. 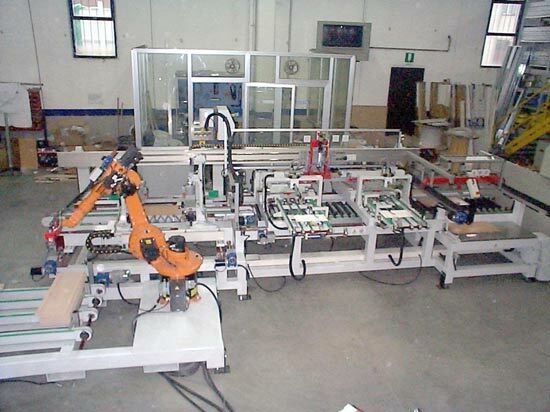 A small to medium sized Italian company dedicated to the manufacture of machinery for the preparation and application of adhesives to substrates prior to the bonding and laminating of various materials. Adhesives can be either PVA, Urea, PU or hot melt. 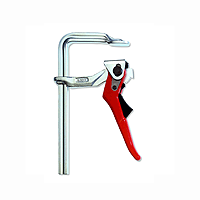 Glue spreaders can be supplied with or without automatic glue dispensers and with or without glue cooling units and also either manual or automatic washing devices. 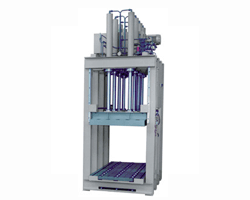 Osama also manufacture nip roller presses for the bonding of contact adhesives. 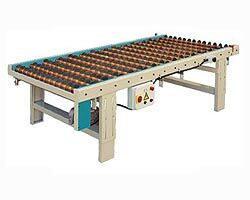 Basic free running or motorised in-feed roller conveyor, ensuring panels are offered to the rollers at the correct height and assists in the reduction of excessive stress on the rubber rollers and the machine bearings. Out-feed disc conveyor for collecting double sided glued panels prior to the lay-up and laminating stages of the process. Can be supplied free running but generally sold as motorised to ensure the discs are always rotating in the bath of water. This ensures the water based adhesives, that have collected on the disc edges, are kept moist and made easier to clean. Motorised units are complete with a photo-cell, secured to the end of the conveyor, which stops and starts the conveyor to prevent panels from dropping off the end of the unit. 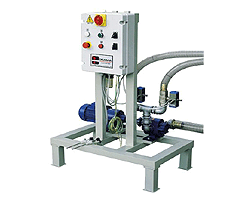 Pumping unit to automatically top-up and feed mono adhesives (PVA) into two and four roller glue spreaders. Sensors are placed into the glue line to monitor the amount of adhesive in the machine. Automatic mixing and pumping two part adhesives into two and four roller glue spreaders. Sensors monitor the glue line and top-up automatically. Fluid adhesive and fluid hardeners are placed into separate tanks and pumped into a small 1.5 Kg container where it is mixed prior to dispensing into the machine. This means that the cleaning procedure in contained to the 1.5 Kg mixing chamber only. 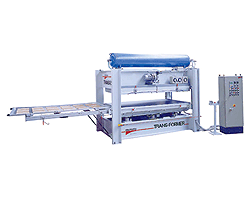 A top quality glue spreading machine supplied with two application rollers and adjacent glue troughs which control the glue line being applied to the sub strate. 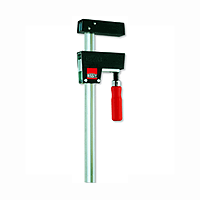 Can be supplied with many optional extras, depending on the application of the machine. 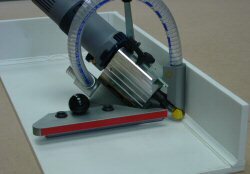 Ideal for veneering or high pressure laminate bonding. 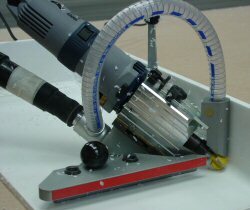 A high quality four roller glue spreader with two application rollers and two doctor rollers that control the glue line being applied to the substrate. Ideal for papers, veneers and laminate bonding due to the low glue weight that can be applied with this method of control. Again, there are a number of optional extras that can be supplied with this machine, depending on the required application. 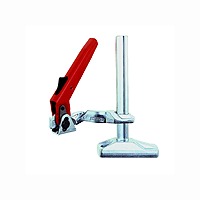 This illustration shows a manual roller cleaning device that can be attached to either the four roller or two roller machines. There is also the option of an automatic, motorised cleaning unit that will oscillate up and down the machine. Both dispense water over the rollers, assisting in the removal of adhesive from the rollers and speeding up the cleaning process. 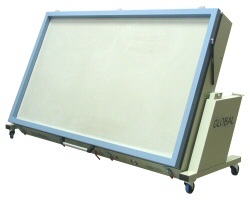 A brushing machine to clean panels and remove contamination prior to glue application. 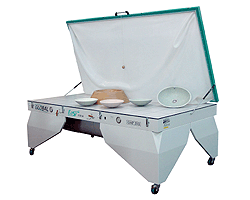 An essential process for thin covering materials that will telegraph the smallest of particles left on the panel. The machine is connected to a dust extraction unit and equipped with a variable speed gear box when situated in a processing line. Vacuum presses have been around for a long time and the principal operation of the machine has not changed, but Nabuurs have now produced this equipment using the latest technology and design methods. 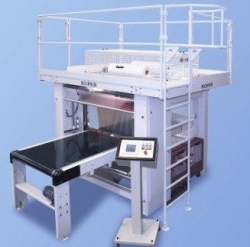 Starting at the small bag press system for panels, shapes and stair-case assembly and advancing to the moder n cold press and hot press design that can be supplied in single or double formation. 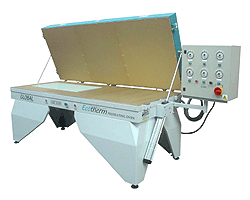 These machines are id eal for the veneering and laminating of flat or curved panels of all types, even the most complicated shape s up to 500 mm high. The Nabuurs vacuum bag press system offers our customers three alternatives, allowing the customer to chose the type of bag to suit his product and production and also the size of vacuum pump. 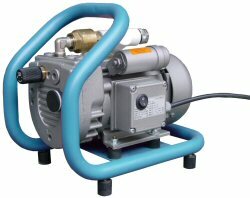 Choice of Analogue pump for continuous running or Automatic pump for auto cut out. 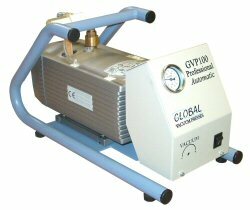 Options for this package offers a 200 litre vacuum tank and equipment to run a number of bags from one pump . Options for this package offers a 200 litre vacuum tank and equipment to run a number of bags from one pump. Bags come in various materials, grade and thickness. Replacement bags and accessories always available. 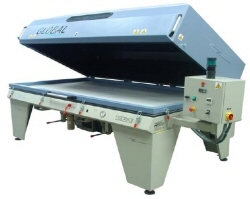 Global Industrial Membrane Vacuum Press is the standard cold press with various bed sizes and optional rubber sheets to suit the working height of the customer. These two illustrations show the Global Industrial Membrane Vacuum Press in a version that allows the customer to fold the machine away for easy storage. Ideal for that small shop with minimum floor area. Global Sprinter Professional. 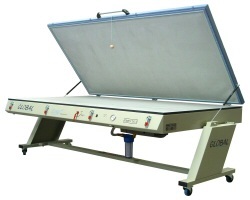 A single station heated membrane vacuum press. This is the heated version of the Global Industrial, and is also available in various bed sizes and working heights. Heat-up time is approximately 15 minutes and operator training is minimal. This is the double station version of the above heated press. By adapting their standard range of machinery, Nabuurs have been able to design equipment to meet the needs of the Thermoforming industry. The shaping and forming of materials such as; Avonite, Corian, Creanit, Hanex, LG Hi-Macs, Paracor, Plexicor, Varicor, Wilsonart, Acrylic glass and other such thermoplastic materials can easily be achieved in this range of equipment. The Eco-therm preheating oven is the first stage for the softening of the product. A pneumatically operated lid makes it easy and safe to gain access to the heating zone. Each machine can be supplied with up-to 3 heating zones and can be supplied with one or two side heating to suit the production of your company. 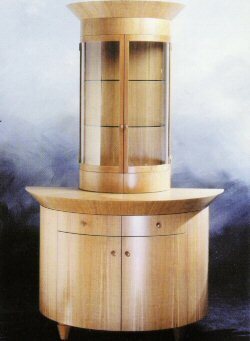 Also supplied in three standard sizes, the customer can select equipment to suit his needs as well as his finances. 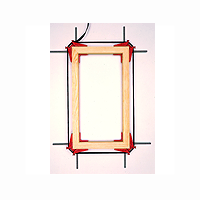 The Global Easy-Thermoform vacuum press is used to produce the final shape of your material. With the assistance of shaped moulds, the materials are transferred from the preheat oven to the Easy-Thermoform where the vacuum process produces the final shape of the material. 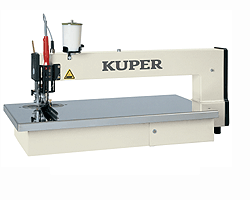 This model can also be supplied with a tiltable table to allow the machine to be folded away for easy storage. Ideal for that small shop with minimum floor area. A necessity for the Thermo-Forming industry is this special router. 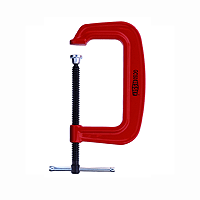 Used for the removal of excess materials in the corners of a fabricated work surface that combine an up-stand. This router produces a radius in the horizontal and vertical back corners of the work-surface, ready for final sanding and polishing.